I had the rare opportunity to be at the right place at the right time to see what happens when “the most learned Torah scholar alive today” prays at the Wall. A few minutes prior to his arrival, the police tried to clear the area reserved for Rabbi Eliashiv. Most men more or less cooperated, which is to say: they moved just enough to say that they had moved, but not so much that they would jeopardize their opportunity to be near the rabbi. However, there was one man who actually came to pray, not to see the rabbi; and he made quite the scene as he was prodded several times to move. Finally, in exasperation, he shouted, “I don’t care if Rashi is coming to pray, I’m standing right here!” With that, the police conceded, and the man continued to pray in that spot. I was surprised to see Rabbi Eliashiv arrive in a Citroen, a rather humble car for someone of his stature. As the car approached, the police did their best to keep the onlookers back enough to allow the car to enter. 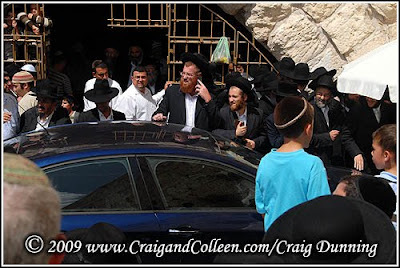 When the Citroen came to a stop near the wall, the crowd pushed in to be near the rabbi. But the security detail managed to forge their way through to the Wall with the rabbi following closely behind them. As Rabbi Eliashiv prayed near the wall, the crowd pressed in to get a glimpse. One man held his three-year-old son up above the crowd so that the boy could see the rabbi, though I’m certain he was too young to appreciate his good fortune. While the rabbi prayed, every minute or so someone would literally get shoved outside the inner circle by the security team. I can only guess that they got too close for comfort, and had to be put back in their place – away from the rabbi! 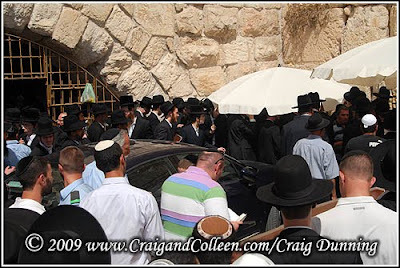 Two umbrellas were placed near the wall to protect the rabbi and his entourage from the sun. The push from the crowd was so heavy at one point, I thought the umbrellas and the rabbi were going to come tumbling down. However, the crowd seemed to notice the danger and backed off, if only momentarily. When the rabbi finished praying and made the difficult trek back to his car, I asked the young man next to me, “who was that?” He was glowing as he gushed, “That was Rabbi Yoseph Shalom Eliashiv. He’s the most learned Torah scholar living today. He’s something like 100 years old. Wow, that was something special.” And it really was. 1. You can see that the crowd is caught in a dilemma: they want to honor Rabbi Eliashiv by not pressing him, but they also want to get real close to him. 2. As the rabbi is trying to get into his car, an elderly man [I’m guessing around 80 years old] is trying to get an audience. 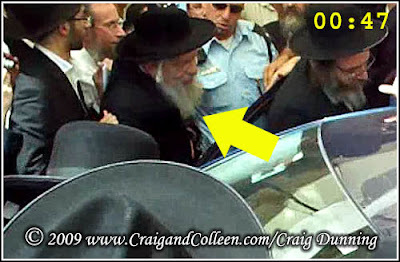 Somehow he managed to get right next to the rabbi, but eventually, a policeman was able to make his way in between them [00:47 in the video] and used the car as a brace to literally push the old man back. 3. Due to the shoving, at 00:53 someone in the crowd shouted the N word [nazi] at the police, but several people shushed him. 4. The policeman continued pushing the old man back, when at 00:58 the old man sinks his dentures into the policeman’s right shoulder! 5. The policeman responded with a swift elbow to the man’s face, which finally succeeded in getting him to back away. 6. However, the old man wasn’t finished: he managed to get around security and approach the window of the car as it pulled away.